document the bills now in the US Congress to disarm the American public. I don't like guns. I wish noone, including the government had any. And though I fall on the far left side of the political spectrum, these days I often find myself in agreement with some of the positions of the far right: these are confusing times where - Nothing's right, and nothing's left. Yet I do not believe in violence, except as a last, very very last, resort. The People could bring Big Government and Corporatism to its knees begging within one week with the methods of Ghandi. If only people would unite! If I belong to any 'ist' or 'ism' as an adherent, I would have to call myself a Constitutionalist. Only the people can ratify a constitution. Loss of Constitutional rights, some say, is a slippery slope; and in some aspects, this is true. But the reality today, is this: AMERICANS HAVE NO CONSTITUTIONAL RIGHTS ANYMORE. The Patriot Act superseded all of them long ago - while America was shopping with mortgage refi money and raising angry fists to bomb them thar evil terrorists in Iraq. Yes they were all gone years ago....but US citizens are just realising this. Americans are in the valley below the slippery slope now. Sadly, this is not just a US phenomenon. It is happening all over the world. The critical difference is that Europe is on fire with protests and America yawns hoping the bedtime story has a 'happily ever after' ending. While Europeans are fighting the changes they see eroding their human rights in the streets - they are still doing it from 'panic-virus'; hopefully, this will mutate into the realisation that 'together we are stronger', and many countries will unite within Europe to voice their concerns about the EU superstructure growing every moment. Ironically, the EU machinery itself (as well as the US machinery) provides the very (international) democractic mechanism by which the People can control the Bureaucracy. It is being used now by the Irish in the NO to Lisbon campaign. It will not become our strength until EU citizens pressure their MPs for unification with other national populist movements. Guns are not the issue here. Evaporation of civil rights which are replaced by an international surveillance and control system of every person's activities is a far more toxic pandemic. 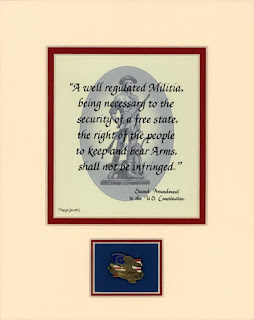 The right to bear arms is a Constitutional one in the US, the purpose of which was to ensure that government could never oppress the People with tyranny. However, now, anyone who opposes tyranny is a 'terrorist': even if the tyranny IS the government itself. And you don't have to own a gun....words on a blog such as this can very well designate one as a 'person of interest' nullifying all Consitutional rights by authority of the Patriot Act. Whether one is far left, far right or center, this enforceable law described below will be what rules daily life for all. I await the day when Americans wake up and realise that people on the other side of the pond are not the enemy; but, fight for the same right to a decent life that all people from all nations want (this is THE purpose of government, no corporate/banking profitability). I posted the story of Alistair Lundeby last week here. This is an example of how the Patriot Act defines a 'terrorist'. Yes, this can happen to you your family anytime - it only takes a call from a cranky neighbour or ex-lover reporting you for 'suspicious' activities or associations. Or perhaps you visited some dodgy websites while doing a search online. Hard to believe, isn't it? That the US (and Great Britain) now have the same state mechanisms as Stalin and Hitler. But a fascist but any name stinks as much. A sinister bill working its way through the House may eventually serve as a companion piece to the Department of Homeland Security’s “Rightwing Extremist” report that labels veterans and advocates of the Second Amendment as dangerous terrorists — H.R. 2159, The Denying Firearms and Explosives to Dangerous Terrorists Act of 2009, sponsored by Rep. Peter King of New York. On April 29, with little fanfare or corporate media coverage, H.R. 2159 was introduced and referred to the House Committee on the Judiciary. The bill would “increase public safety by permitting the Attorney General to deny the transfer of a firearm or the issuance of firearms or explosives licenses to a known or suspected dangerous terrorist.” The entire bill can be read on the Govtrack website. A similar bill was introduced in the Senate in 2007 but did not make it out of committee. As noted above, the DHS has compiled a long list of folks the government considers terrorists. The bill, if enacted, would allow the attorney general, a documented gun-grabber, to deny millions of Americans due process. “[Rep. King] would deny citizens their civil liberties based on no due process,” Larry Pratt, executive director of Gun Owners of America, tells WorldNetDaily. On May 1, 2009, Infowars reported on the existence of another DHS document, the “Domestic Extremism Lexicon.” It adds more suspected terrorists to the government’s list, including people working in the alternative media, anarchists, pro-life activists, skinheads, lone terrorists, members of the militia movement, “decentralized” terrorists, and others. Earlier this week, a man was stopped in Louisiana and detained by police for the crime of displaying a “Don’t tread one me” bumper sticker on his car. A background check was conducted to determine whether he was a member of an “extremist” group, according to The American Vision website. “Don’t tread on me” was originally displayed on a flag designed by general and statesman Christopher Gadsden during the Revolutionary War. It is depicted as a terrorist symbol in the DHS “Rightwing Extremist” report. Stephen Halbrook, Independent Institute Research Fellow and author of the book The Founders’ Second Amendment, testifies before the Senate Judiciary Committee in opposition to Attorney General nominee Eric Holder. 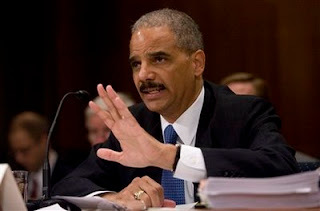 During Holder’s shoo-in confirmation hearings earlier this year, Stephen Halbrook, Second Amendment attorney, detailed Holder’s vehement opposition to the right to bear arms. Holder’s role in the Waco massacre and Ruby Ridge were expected to be brought up during the hearings but were not. Shortly after 9/11, Holder penned a Washington Post op-ed entitled “Keeping Guns Away From Terrorists.” In the article, the future Attorney General argues that a new law should give “the Bureau of Alcohol, Tobacco and Firearms a record of every firearm sale.” He also states that prospective gun buyers should be checked against the secret “watch lists” compiled by various government entities. In order to make his point, Holder makes the ludicrous hypothesis that Osama bin Laden would be able to purchase an unregistered firearm at a gun show in America. The government now possesses the appropriate “watch lists” and has designated specific categories of Americans as domestic terrorists. If H.R. 2159 becomes law the Obama administration and the Justice Department will go after opponents to their far-reaching plan to disarm the nation and deliver it defenseless into the clutches of bankers and corporatists determined to reduce a once proud constitutional republic to the status of a fuedalist backwater.